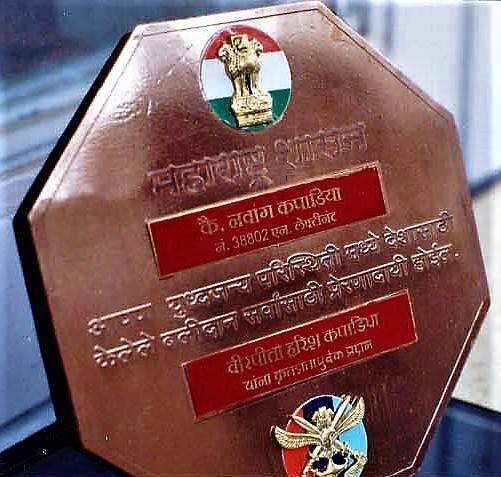 Lieutenant Nawang Kapadia was born on 15th Dec 1975 in Mumbai. 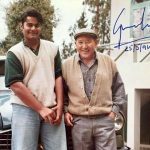 Son of Sri Harish Kapadia and Mrs Geeta Kapadia, Lt Nawang inherited the adventurous streak from his parents who were renowned mountaineers. 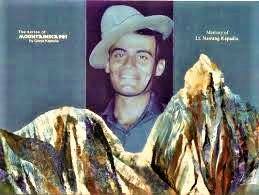 Lt Nawang and his elder brother were named after Sherpa mountaineers. 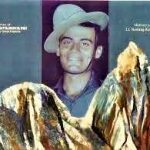 His name ‘Nawang’ means ‘Leader of Men’, which he later proved to perfection. 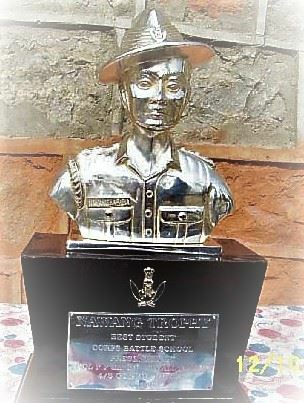 Lt Nawang had his primary education in New Era School and completed schooling from St. Xavier’s Boys’ Academy in Mumbai. 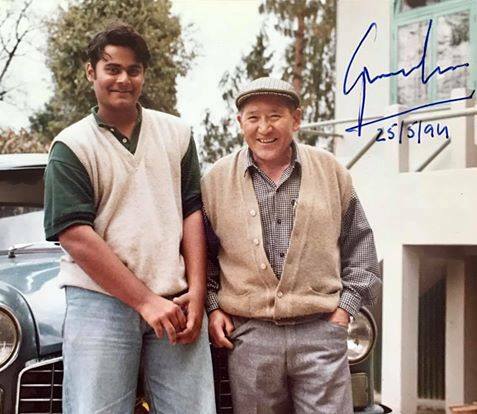 He later graduated with a degree Commerce from Jai Hind College in Mumbai. 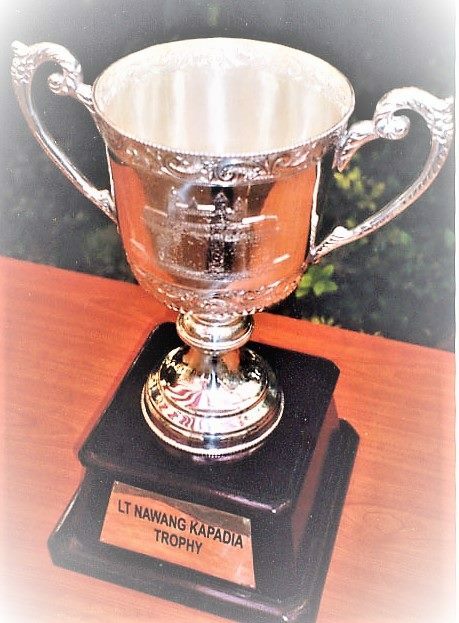 During his student days, Lt Nawang was always a free-spirited lad, spending a lot of time on the sports’ field and displayed leadership qualities from a young age. 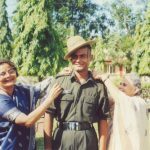 At the age of 24, Lt Kapadia joined Indian Army in September 2000 and was commissioned as Lieutenant in the 4/3 Gorkha Rifles. 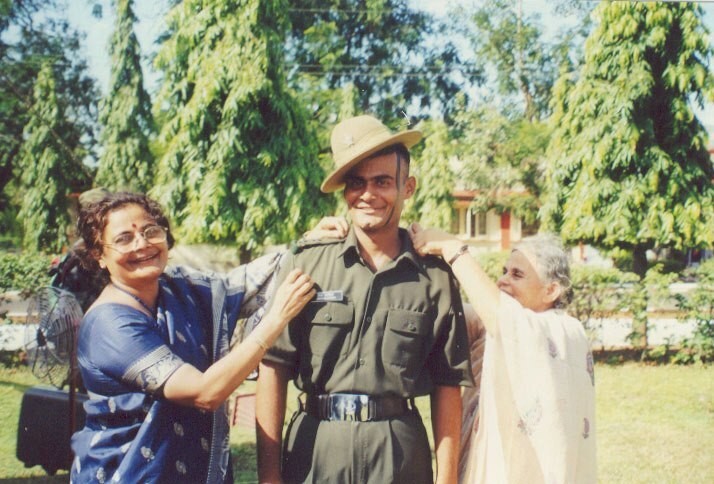 On 29th October 2000, he joined his Battalion deployed in the Kupwara district of J&K. 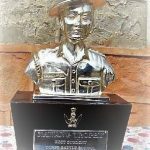 The Battalion was engaged in anti-insurgency operations in the terrorists infested area of J & K. Lieutenant Nawang got immediately involved in those operations and showed his commitment and leadership skills. 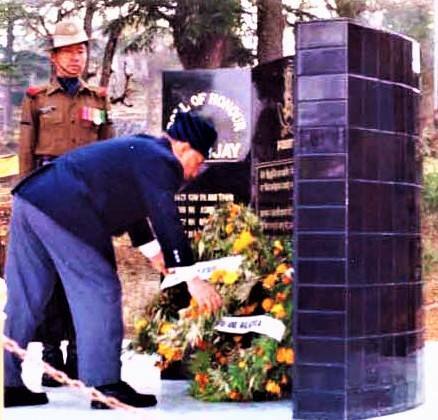 On 10thNov 2000, the intelligence sources had provided information to the security forces about the presence of a large number of terrorists hiding in the notorious jungles of Rajwar near Kupwara. On assessing the situation a decision was taken to launch a search and destroy operation with Lt Nawang as leader of his platoon. Lt Nawang immediately swung into action along with his troops and during the operation, a large hideout was discovered by the Battalion troops. On being challenged the terrorists opened fire and Lt Nawang’s platoon faced the attack from a group of eight to ten terrorists hiding in the vicinity. Hav Chitra Bahadur got hit by bullets and was seriously injured. 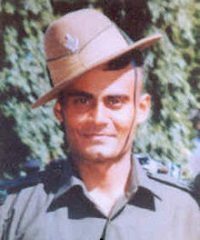 At this stage, Lt Nawang instinctively rushed to rescue Hav Chitra Bahadur, firing his weapon ,under the covering fire of his comrades. However a terrorist, hiding in the nearby foliage fired at Lt Nawang. In the following exchange of fire Lt Nawang got seriously injured and was martyred. However, his sacrifice did not go in vain as two of the terrorists were killed and two critically wounded in the 36 hour battle that ensued and large quantity of ammunition was recovered. 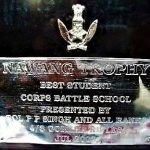 At the young age of 24 years Lt Nawang showed exceptional courage and unyielding spirit in the face of enemy which inspired his troops to accomplish the assigned mission. 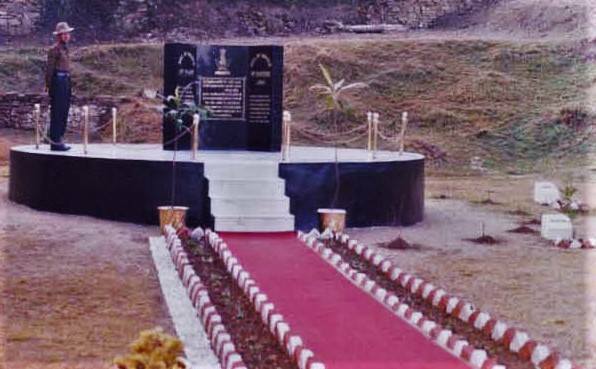 4/3 Gorkha Rifles Martyrs’ Garden bears his name along with other martyrs who laid down their lives for the nation. 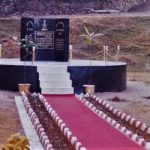 In order to train the soldiers when they start their Counter Insurgency tenure in the Kashmir Valley, the Corp has established a Battle School. 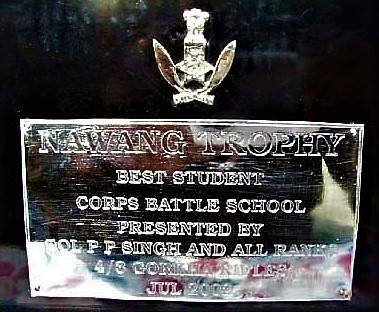 The Battle School has instituted the “Nawang Trophy” in his honour which is awarded to the best performer in the course. After two weeks of celebrations and farewell, the time has come for the final goodbye. It all started with filling up the form and getting it attested in college and then came the written test in Oct. Then the good news of the clearing that too. The journey to Allahabad, full of anticipation and HOPE. I met Nikhil Pillay, Shiby, Tall and Manish. Screening was very confusing. No one knew who was right and what was ’right’. Made it through that and was in the last 15 out of 66. 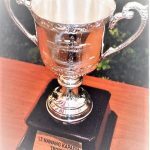 Start out with the physiological tests and mathematical abilities test. Move on the Situation Reaction Tests and so on. I think I made good friend with the other 14 in the days that we spent together. Command Tasks and group discussions were so much fun. One of the group from Rajasthan had some very serious views on marriage and wife. But it always take all to make the world. I think I did OK in the Command Task. No one really dominated them anyway. The next day during the snake race etc. I was OK again. It is all so new and so much like a game, so much fun. I have a good interview! Col. Mohan I am sure was impressed. He asked me all about HBK, SHK, GHK and how argued with them and my views on reservation etc. I managed 9 out of 10 in individual obstacles which was better than most. Always think toe! It always helps. MADE IT! Now chest no 13, Kapadia Nawang R. No. 020327, RSNL : 70325 is selected to proceed for medical tests! UNFIT DNS (L), Squamous Blepharitis and overweight! Back in Mumbai after a trek to Kinnaur. Went and got the DNS operation done and also got the eyes checked. INHS Ashvini cleared me in 2 but am still overweight. Now, what? Is this the end? Sardarji messes up paper. Sends them to Delhi when they need to go to Pune. I go on a strict diet and jog daily, touching 6-10kms. Help and good wishes of people are always there. Discover the pleasure of jogging at PDP. Feels good being able to jog 6-8 km in once evening or morning. Sqn Leader Walter Mascerhanes helps. Shows very easy looking but effective exercises. Papers mixed up. No correspondence from Army. What is happening? Go to Pune, all set to be weighed along with Arif Pathan. 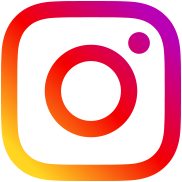 Nothing happens. They have no news about anything. What do now? 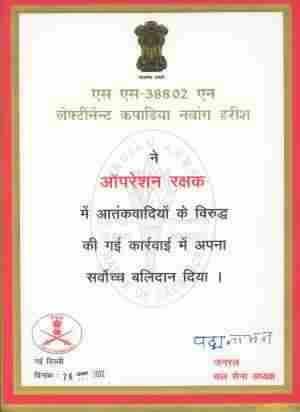 Ashivini has sent the papers to Rtg Division. 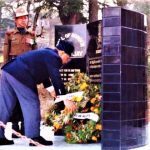 Major Aman Nugyal helps. I call up Rtg Director they give some more confusing signals. Am helpless. Decide to fly to Delhi and try and clear out some things myself there. Stay with Aman and Anjali. Met Rtg Division and he tell me it is all now in the handles of the Medical Director (DGNS) Col Pradhan, great guy. Very helpful. Orders my medical in Delhi itself. Things seem to be moving now. At last. Met Tally in Delhi. He has helped so many people he is now a hospital expert. Knows whom to meet, pamper and keep happy. I spent most of my time waiting to be checked and then finally cleared it. One whole week in anticipation of being weighted and then on a Saturday I was finally weighted. It was party time then onwards. Starting at home with pizzas with Nikhil and Tally. Then next day a big breakfast with Gen Nugyal and family. Next 2 days spent just waiting for my Medical Board and drinking beer and parting. Back in Mumbai!! Went to the Thai Pavallion with Ma, Sonam, Reshma, Arif, Suhail and the Doc. Had a great time. This signalled the beginning of partying in Bombay. Then over the next month went for dinner to Rodhan Kaka’s house, Dr. Burjor, Mrinal’s had a farewell dinner at home with all the ‘Mountaineers’ gang and more biryani at the Pathan’s residence, lunch with Siddhanand Bhauji, dinner with Aruna Maushi and Anju Maushi, dinner with friends at home and lunch with Savita Maushi and huge ice-cream desserts with friends. In between went to Ratnagiri where Mrinal and Angya were doing their internship. Had a wonderful time. So all this finally lead to the 25th October when I caught the train from VT for Chennai. There were 2 more guys in the same train also going to Officer’s Training Academy (OTA). The next whole day in train and then Chennai. 80-90 guys from all over India were present, met Tally once again.